On the 3rd January 2019, only a few weeks after winning the 10th Hamamatsu International Piano Competition, Can Çakmur returned to the ACT CITY Concert Hall in Hamamatsu in order to record his début disc. 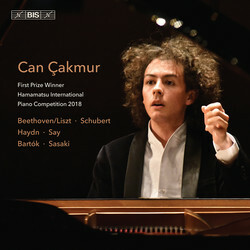 Can’s chosen programme reflects his wide-ranging musical interests – from Haydn’s late F-minor set of variations and Schubert’s early Sonata in E flat to Sacrifice from 2017, composed by Fuyuhiko Sasaki for the competition. Also included on the disc are Liszt’s transcription of the Beethoven song Adelaide, and Black Earth by Can’s compatriot, the Turkish pianist and composer Fazıl Say.